The longest piece in the kit could be no more than 12 feet long to allow the bridge to be easily transported. Allow assembly with only battery operated tools like a screw gun. Completely bolt together (no welding). The bridge will be installed near the coast and needed to hold up to salt air. 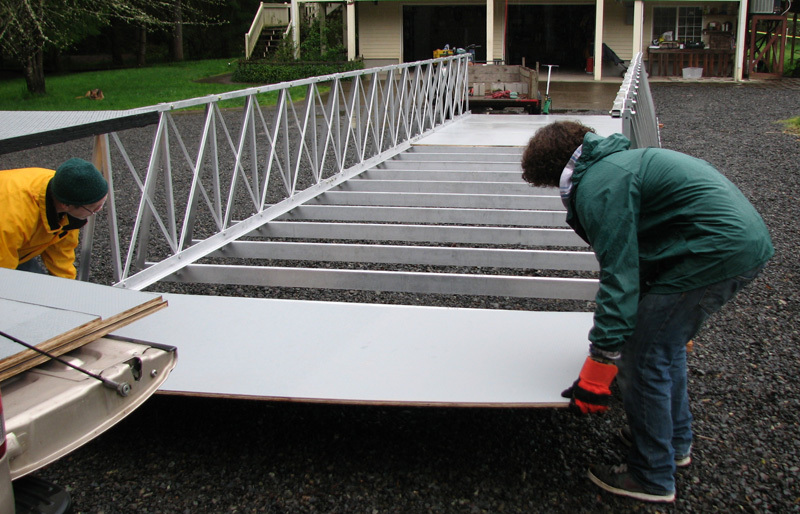 Before shipping we decided to completely assemble the bridge so that we could test it and get some photos. The fully assembled frame weighed about 585lbs. Before installing the deck, we moved it to a scenic location outside where we could get some nice pictures. We put a dolly under the back of the frame and set the front of the frame on a trailer towed by an ATV. Once the frame was in place we set each end up on concrete blocks so that we were truly free spanning. The next step was to set the plywood in place. Before screwing down the plywood, we leveled the bridge side to side and we measured the bridge corner to corner to make sure everything was even. With the deck in place, it was time to give it a try! …we grabbed a nearby Toyota Previa and drove on up. The deck is 5/8” thick fir plywood and the joists are on 24” centers. This is not designed to carry the lbs per square inch that would be generated by the little mini-van tires. So we covered the deck in 2×6 boards to help distribute the load. While this is more load than this particular bridge is warranted for, the engineering shows that it should support this weight at rest and still have a safety factor of 3.0 (this means that forces three times greater will be required to break something). 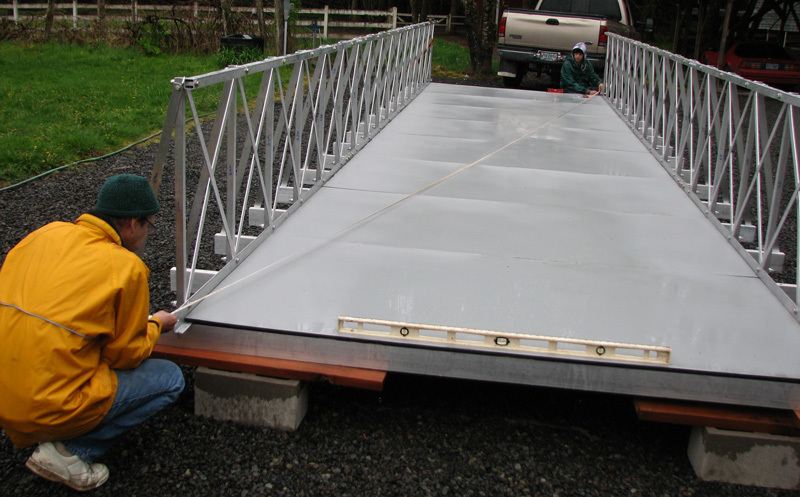 Properly assembled and installed, this bridge should provide a lifetime of trouble free service as an ATV bridge in the wilds of Alaska or wherever it is placed. Boat Shows are a boat load of fun! 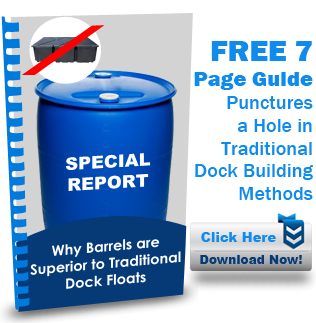 We haven’t gone to many in the last few years, just because it’s been practically impossible to keep up with the floating boat dock orders down in the shop. But we did the circuit a few years ago and it was a lot of fun. 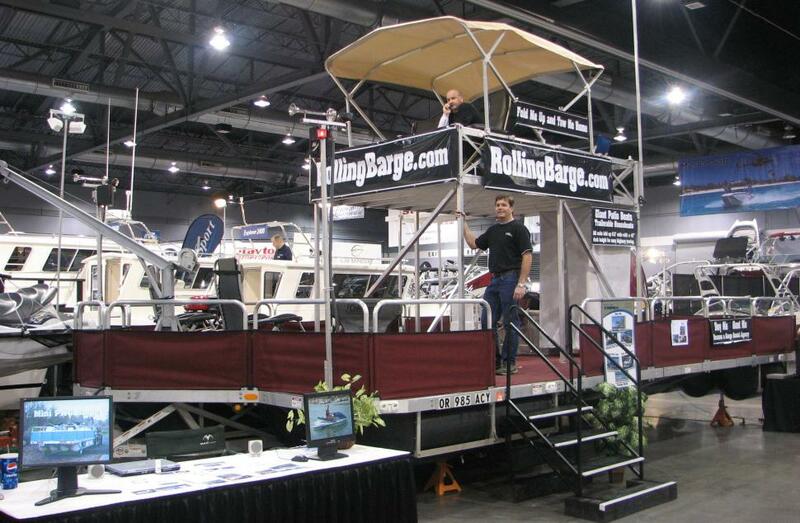 Just so you know, most boat builders and dealers go to trade shows to sell boats. Our experience was, that just being around a bunch of people that were like minded made it worth the cost of admission. If you get a chance, Google ‘Boat Show’ with the name of your city and go check one out. If you’ve never been, you will have a great time! Houseboat Magazine’s National Houseboat Expo. Come see our largest Rolling Barge yet, 650 sq ft of deck space and 30 person capacity. Let us take you for a cruise on Lake Cumberland. 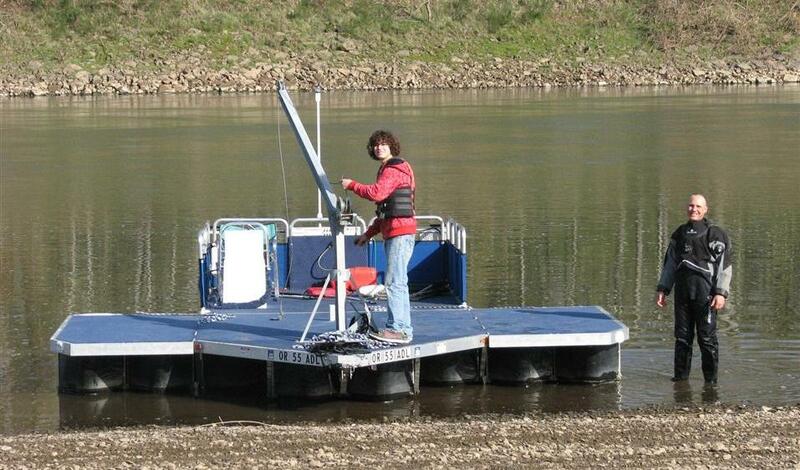 We will have our flag ship Rolling Barge on display — the Portable Dock & Barge Systems. Come walk through our barge and meet the entire Rolling Barge team. See you at the Show! into a small work barge to perform the task. 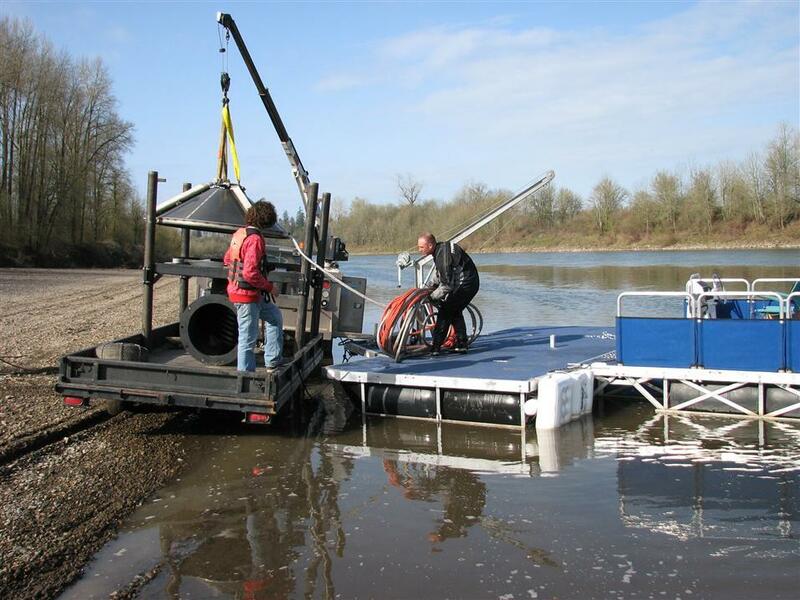 They also needed us to actually assist them with the installation since they were not very comfortable driving a large converted dock up one of the west’s largest rivers. So for a brief moment Rolling Barge was in the self-cleaning intake screen business. 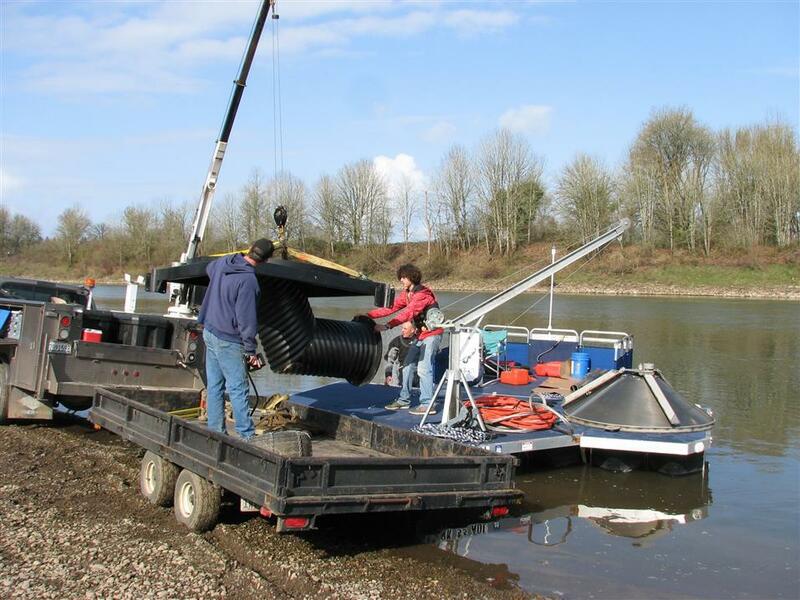 We loaded over 2000 lbs of equipment and tools on the barge and drove it upstream about 1 mile. We used the 1000lb davit crane to set our base, our support piles, and our screen in place. This set-up worked very well for our type of in-water work, which consists of components that are too large to handle and a site that was inaccessible by crane (look at the cliff in the images below) The barge worked great and there was lots of space on the deck for our tools. floating trailer that is capable of carrying up to 5000 lbs right down the launch ramp and into the water opens up a lot possibilities. 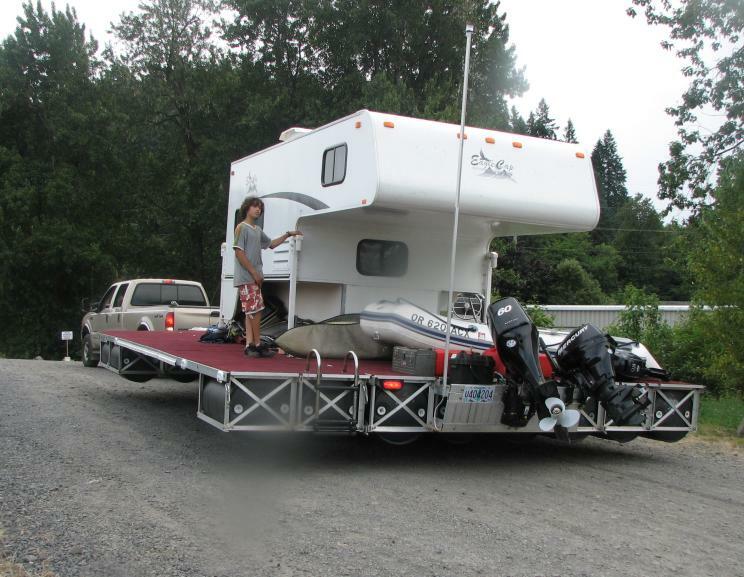 Shown here is one customer that mounted an 8.5′ slide-on camper onto a floating dock kit that was converted in a floating barge. 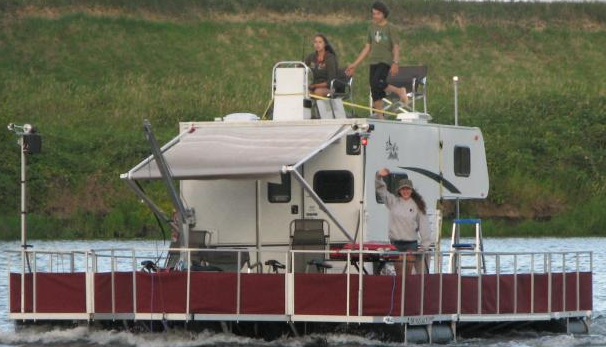 This customer created for themselves a trailer-able houseboat complete with wrap-around porch and sundeck. Note: All Rolling Barge products are shipped fully certified by both the National Association of Trailer Manufacturers and the National Marine Manufacturers Association. You may choose to modify the product or use to carry something that causes it to no longer be certifiable by either of these organizations. For more information on the load capacity of our products please check out some of our Engineering Reports . If floating dock permits are costly where you live, you’ll be happy to know that all of our floating docks can be registered as a U.S. Coast Guard Approved boat and fully insurable as a vessel. If you are having trouble getting permits to install a dock, find out if you can legally park a boat in front of your waterfront property. If so, licensing one of our docks as a boat could be just the break you have been looking for. Note: we have several customers that have completely avoided permit fees because their dock is licensed as a boat. Better yet, several live on lakes that do not permit docks at all–problem solved! section with options for several motor sizes. If you install a motor to your dock you will be able to move it out into deep water and use it for a swim platform or just put around the lake like a regular boat.